Follow me on Academia.edu Basic characteristics of taxa in the genus LUPINUS L.
Basic characteristics of taxa in the genus LUPINUS L.
Successes in genetic studies and breeding practice depend on the availability of a well-developed phylogenic system of a genus. Regretfully enough there is no comprehensive monographic and systematic review of Lupinus L. by now. The presence of such a breach may be explained by inaccessibility of the habitats of the American lupin species, large variability and weak differentiation of characters in lupins, and intricacy of their classifications. As a result, it is still unknown how many species of lupin exist in the nature. This circumstance hampers the solution of numerous theoretical and practical problems. Each form of lupin can be assessed as an object fitting in with a number of consecutive taxa. A taxon is a part of plant community consisting of a certain set of individual plants distinguished according to genetic principle by the uniformity of their genesis, and regarded as a formal unit at any level of hierarchic classification. 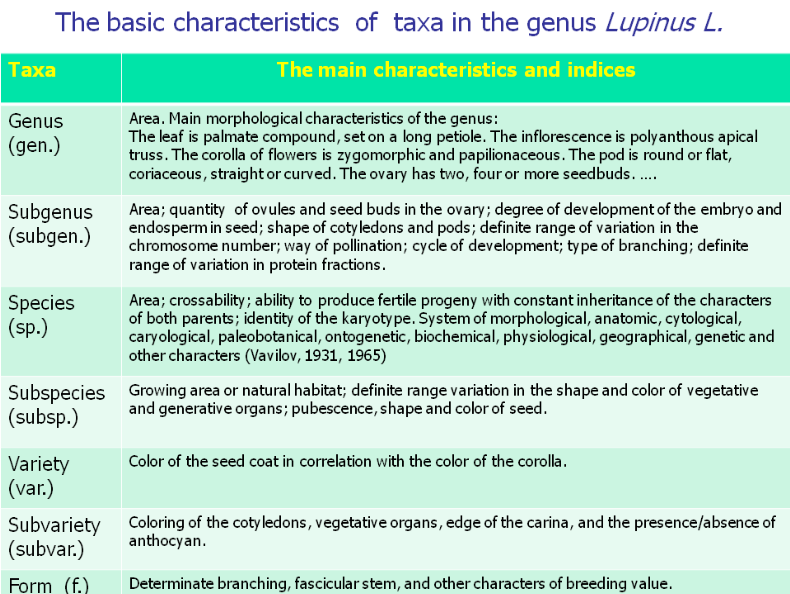 Basic characteristics of the genus Lupinus L. and its taxa are presented in the following Table. This genus is the principal object of our research. Geographic differences between the New and Old World’s lupins are shown in Table 1 where the grouping of both subgenera is introduced. Different species, subspecies, varieties, subvarieties and forms were classified on the basis of Vavilov’s concepts (the law of homologous series in hereditary variation, studies on the problem of the species as a system, differential systematic and geographical method of crop studies, and others). Vavilov’s (1931, 1965) concept about the species as a complex multilateral and mobile phenomenon implies application of diverse methods for identification of differences between intraspecific categories. We recognize subspecies (subsp.) as an isolated group of individual plants within a population of a species. They occupy certain part of the area of a species, constitute together a mobile system, are able to cross among themselves and with plants growing in other parts of the area of this species, produce prolific progeny, possess distinctive morphological and inheritable characters in vegetative and generative organs with the uniform genetic base, and incorporate transient forms. (subsp. graecus, termis and albus within the limits of Lupinus albus L.). Allelism and character complementarity tests have shown that in lupins the colour of seed is correlated with the colour of the corolla. This linkage reflects the stability of genetic system, which corresponds to the rank of varieties (var.). A good diagnostic character is the colour of vegetative parts, and the absence or presence of anthocyan, in particular. Being less stable, it could be used in identifying subvarieties (subvar.). Considerable practical interest for breeders may be generated by the plants with determinate branching, fascicular stem and other characters of breeding value. Such forms are theoretically possible in all the varieties and subvarieties systematized by us. Therefore, it seems justified to regard them in the rank of forma (f.). N.I. 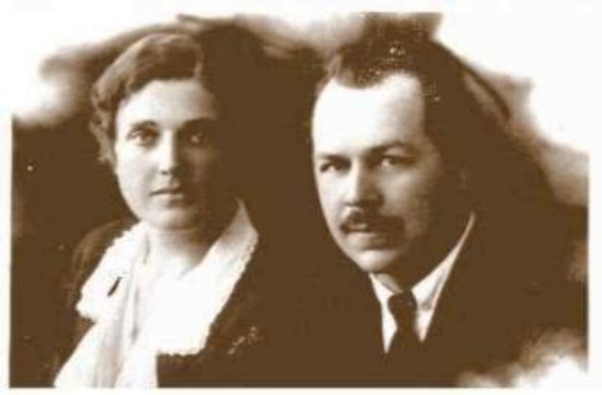 Vavilov with his wife E.N. Barulina, 1926 (before their expedition to the Mediterranean). E.N. Barulina was the leading scientist in the field of genetic resources of Leguminous crops.